I was in Mr Bailey’s class 1954/1955. He was the English teacher and a friend and I contacted him about 20 years ago, he had moved from Benfleet to somewhere in the Midlands. We wrote to him and he was kind enough to reply. Miss Boon was Deputy Head and we used to refer to her as Wiggy, as her hair was always combed into exactly the same tight wavy set! Miss Elliot took PE. Mr Ellison was the history teacher and I think he lived in Badger Hall Way. Mr Ward had left before I started school there and I used to play with his daughter, Kaye. I believe he went to Wickford School where he was Headmaster. Mr Beddow was the music teacher, but his band was not formed when I was attending the school. The swimming pool was not built at the time. A few years ago, I went to view a bungalow in Hadleigh and realised it had been the home of Mr Evans, former Headmaster, as there were a lot of photos on view which were taken of him and his wife in their earlier years. It brought back a lot of memories. Hello Elsie, I do remember you, I was at the school from about 1950 to 1953. I left school at end-of-term just before Christmas and started my working life on Dec 29th 1953. The one boy I can remember is Les Ward as he had a leg that was wooden. There is one other lady I know who is now a family member. Nice to hear from you, Brian Bellamy. Your name rings a bell Brian but for the life of me I cannot put a face to it…I moved from Benfleet to Yorkshire 9 years ago having lived in Hadleigh/Benfleet all my life ..Mr Beddows brings back wonderful memories as I used to sing in the choir and had such fun..’Fritz ‘and ‘Wiggy’ head master and mistress also bring back memories…. In regard to the query of the ‘House Names’ way back in the 1950’s….at Benfleet Shipwrights drive Secondary….I recall, I hope correctly..that they were, as follows…….DeVere – DeLacy – Appleton &- Essex……….and in brief regarding favourite Teachers…I knew Miss Elliott personally, as apart from her role as P.E. Teacher, she was also one of our Housemistresses for the Church Road, Thundersley, Runnymede House boarders.. Although this building is long gone, in it’s place now stands the Kingston Junior school, but the happy years that were given to the young residents, from Miss Elliott and Mrs Corden, will long be gratefully remembered…. I left Shipwrights Drive secondary school, as it was commonly known in those days, Christmas 1953 and still live in Benfleet and have lived here most my life except during RN&MN service. My two children went to King John as it is now. The teacher who influenced me the most was Mr Beddows and his music and also ‘Fritz’, the Headmaster Mr Evans. Is there anyone of this year still a resident of Benfleet? 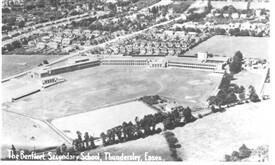 Hi everyone, just found this site, I too was at this school in 1950/1955 and remember the said teachers very well. Mr Jones was the male PE teacher and Mr Blake was my RE teacher. Mr Bailey’s wife was my daughter’s private tutor when she was too ill to go to school. My sister and I have been trying to remember the house names in that period…can you help? Editor’s note: In later years the school had house names which may have been the same as much earlier. There is a school diagram on this site, where a past pupil has shown the layout and house names in the early 70s. Hi Kay, fancy meeting you here. Kay and I knew each other at school and had a friendship that lasts till today. We regularly correspond even though we are now half a world apart as I now live in Adelaide, Australia. Val, your name is familiar but I can’t recall knowing you. Perhaps you left your mark somewhere, somehow at the best school ever. Hi Kay, You probably won’t remember me as I left King John School in the summer of 1954. You mention Miss Elliott the PE teacher. I have kept in touch with her over the years. She married George Coates and had two sons, Timothy and Peter. She lives in Worthing and last year she had a stroke. Her speech is very much affected, and she has a live-in carer, so I don’t telephone her anymore, but I still write to her. I remember Miss Boon, Mr Ellison and Mr Beddows well.